Palestinian activist, Ali Abunimah, discussed Barack Obama’s overnight switch from Pro-Palestinian activist to supporter of Israel. There is more of this video interview at Democracy Now! Ali Abunimah is the co-founder of the online Pro-Palestinian publication The Electronic Intifada and the author of One Country: A Bold Proposal to End the Israeli-Palestinian Impasse. AMY GOODMAN: Ali Abunimah, I wanted to ask you about the candidates in the United States. You’re speaking to us from Chicago, so let’s start with Barack Obama. The stances of the presidential Democratic and Republican candidates on the Israel-Palestine conflict. I can’t remember when in a debate they were asked about the mounting crisis there. ALI ABUNIMAH: I don’t know if they’ve been asked in a debate, but whenever they have been asked, they have all gone out of their way to express full support for what Israel is doing. Barack Obama is not distinguished from the rest of the pack, except by for how far he has moved to try to appease AIPAC and pro-Israel movements. I remember, Amy—I knew Barack Obama for many years as my state senator—when he used to attend events in the Palestinian community in Chicago all the time. I remember personally introducing him onstage in 1999, when we had a major community fundraiser for the community center in Deheisha refugee camp in the occupied West Bank. And that’s just one example of how Barack Obama used to be very comfortable speaking up for and being associated with Palestinian rights and opposing the Israeli occupation. And just yesterday, he apparently sent a letter to Zalmay Khalilzad, the US ambassador at the UN, to urge the US not to allow any resolution to pass criticizing Israel and saying how Israel was forced to impose this barbaric medieval siege on Israel. None of the other candidates in the mainstream have spoken out for Palestinian rights. The only ones who have taken forceful positions opposing the current US strategy are Dennis Kucinich on the Democratic side and Ron Paul on the Republican side. The mainstream are all perfectly comfortable with the war crimes that Israel is committing, no matter how much they talk about human rights elsewhere. The Electronic Intifada reported earlier on how Obama suddenly learned to love Israel. More… Shocker!! 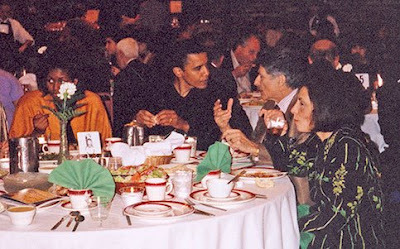 Obama took the endorsement of the Pro-PLO Socialist Party. And… There is also news out tonight on the Nation of Islam members on the Obama payroll.